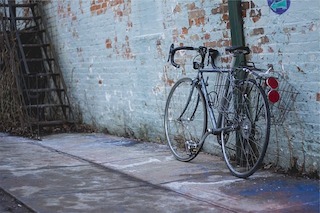 Beloved bicycle, where art thou? Why didst thou leave out of the blue? For without thou I cannot be. Lily puts pictures of her bike on all the lampposts. And determined she couldn’t afford one, for a start. She wants hers back, she loves it a lot. It was a present from a guy she never forgot. So she needs it for memory and mobility alike. I didn’t mean to mash Writing 101: Poetry and FFfAW, but the prompts demanded to be used together. Who am I to put up a fight? Oh, and if you are interested in what I have to say about writing my 100-word stories, my first mslexia guest post is up today.